MCLEAN, VA--(Marketwired - Oct 10, 2013) - Freddie Mac (OTCQB: FMCC) today released the results of its Primary Mortgage Market Survey® (PMMS®), showing average fixed mortgage rates changing little for the week amid the federal debt impasse in Washington, D.C. and a light week of economic data releases. 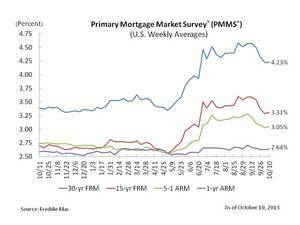 30-year fixed-rate mortgage (FRM) averaged 4.23 percent with an average 0.7 point for the week ending October 10, 2013, up from last week when it averaged 4.22 percent. A year ago at this time, the 30-year FRM averaged 3.39 percent. 15-year FRM this week averaged 3.31 percent with an average 0.7 point, up from last week when it averaged 3.29 percent. A year ago at this time, the 15-year FRM averaged 2.70 percent. 5-year Treasury-indexed hybrid adjustable-rate mortgage (ARM) averaged 3.05 percent this week with an average 0.4 point, up from last week when it averaged 3.03 percent. A year ago, the 5-year ARM averaged 2.73 percent. 1-year Treasury-indexed ARM averaged 2.64 percent this week with an average 0.4 point, up from last week when it averaged 2.63 percent. At this time last year, the 1-year ARM averaged 2.59 percent. "Mortgage rates were little changed amid the federal debt impasse in Washington, D.C. and a light week of economic data releases. Of the few releases, the private sector added an estimated 166,000 jobs in September, which were fewer than the market consensus and followed a downward revision of 17,000 workers in August, according to the ADP Research Institute. The Institute for Supply Management reported a greater slowing in growth in the nonmanufacturing industry in September than the market consensus forecast." Freddie Mac was established by Congress in 1970 to provide liquidity, stability and affordability to the nation's residential mortgage markets. Freddie Mac supports communities across the nation by providing mortgage capital to lenders. Today Freddie Mac is making home possible for one in four home borrowers and is one of the largest sources of financing for multifamily housing. For more information please visit www.FreddieMac.com and Twitter: @FreddieMac.